on July 18th at 8:00 I would like to extend my hand to the entire community and invite you all to join me on Catskills in Skara Brae for fun, laughter and excitement. Jousting has always been a part of the Role-Playing community, but sadly it has not been done in some time. I have waited until after the elections to create an atmosphere where we can meet all the Governors of the nine major cities. There is roughly 80 Million in gold prizes to be won. I hope to see you all there! Join us at the fairgrounds 30 minutes prior to the main event for some drinks and fun. Meet the Champions and Governors of our fine cities. Head on over to one of our booths, get your fortune read or a kiss from a young lady. Pick up a ticket for our large raffle, and possibly win your very own Dexxer suit. My plan is to have a bracket of eight to nine contestants. With single round eliminations leading into the finals, which will then become a best of three. 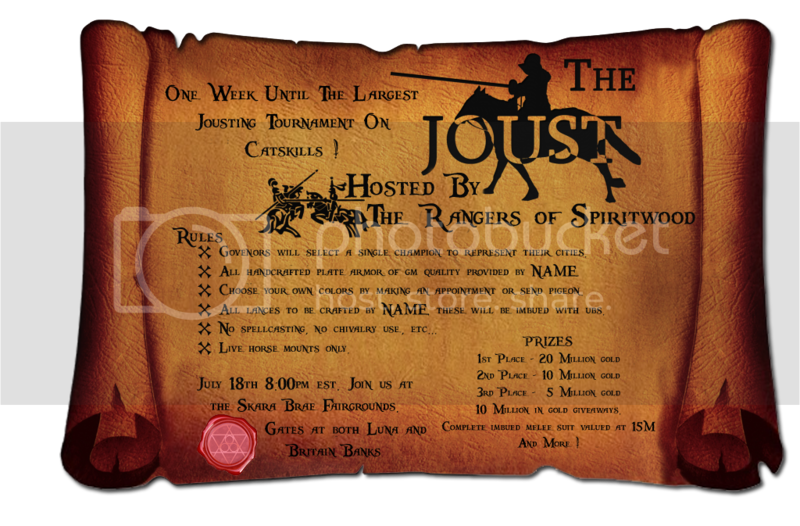 I am not aware of the last time a jousting tournament has been held on the Catskills server. Each major city will be represented by both their Governor as well as a chosen Champion. - Governors will be asked to select a single champion only. - There is to be No spellcasting. No Divine Fury, or Evasion etc. before a tilt. This is to be based on skill. - Use a real horse (Ie: not an ethy) is a must. - There is to be no jewelry, or arties of any kind. - single round eliminations prior to Finals. - Finals will be a best of three. *Please contact me @ ICQ - 693916775 for all crafting needs. The Gold Drop - Roughly eight millions in prizes. Gold will be split amongst the Greeters. Once the �hand� drops they will quickly toss gold checks into the arena while the spectators run frantically attempting to pick up as much as they can. Simple event to allow �everybody� to win. Pick the Pea � Two million gold will be given to a random greeter. The greeters will stand in a line and a random spectator will have a chance to choose what greeter is holding the prize. If selected properly, they will win. (May just cheat and let them win anyways.) A seat will be chosen prior to seating, the person who sits in that seat will be the lucky player. The Raffle � There will be a dexxer imbued armor set. (I can give details on stats later.) Random numbers will be placed within an in game book. Each random number will be paired with a random five letter word so that no spectator is able to cheat. The number will be drawn from a hat and the prize given to them. *Note; I ask that the Governors remain seated for all events, and enjoy the crowd. Champions of Britannian Jousting Tournament itinerary. *Trophies will be displayed Until Finals. If there are any questions, please feel free to message me here, in private or on ICQ.